So the place is Maple City, formerly known as Pegtown. Right on the corner across from the Post Office and Gabe’s Country Market you’ll find Pegtown Station. It is a cozy little diner with a folk-ish feel. 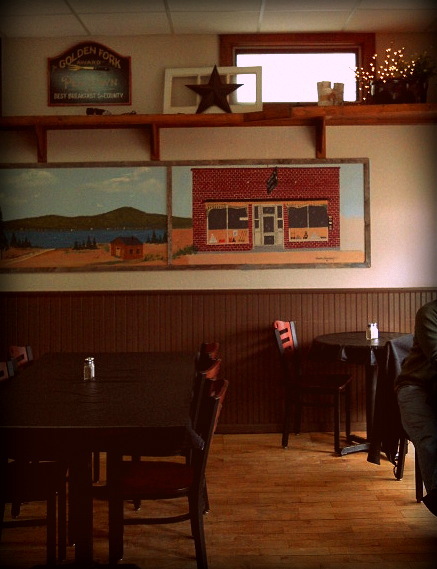 From the folk styled artwork on the walls to the friendly folks who own the place. That’s were we met Mary, the owner, who waited on us. Mary was raised in the area and as it turns out, we know some of the same people (who use to work at Woody’s in Northport). Small world. What I love about this place, is the real people-real food atmosphere. Not pretentious at all. They are local (hard working) people, serving local people. And they are open all year. I suggest you make the trip to Maple City this winter for a good bite to eat. You’ll be glad you did. Pegtown Station serves breakfast until 11:00 (1:00 on Sundays) and lunch and dinner after that. Breakfast is served table side and you can order at the counter after that. They have great deli sandwiches that would make a nice picnic on the beach too. Tuesday-Thursday 8 a.m. – 9 p.m.
Friday and Saturday 8 a.m. – 10 p.m.
Sunday 8 a.m. – 8 p.m.